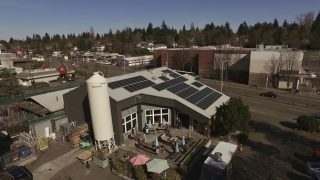 This year, Hellbent Brewing Co. installed a solar energy system on its roof with the help of Seattle-based Sphere Solar Energy and found other resource-saving measures through Envirostars, with guidance from the Office of Economic Development. Hellbent Brewing now boasts the largest solar energy system on a brewery in Washington, generating about 30 percent of its own energy. Thanks to an incentive programfrom Seattle Public Utilities, Hellbent Brewing is also installing a new clean-in-place brewing system, which will reduce their yearly water bill by $3,000.